Tzmfg.com is a b2b marketplace of export and import,offers business directory,catalog and trade leads to importer,exporter,manufacturer,wholesaler,supplier. International e-commerce platform in China by Taizhou Taizhou and Ningbo Bureau of Foreign Trade Co., Ltd. E-commerce Internet business together to create an international trade export enterprises in Taizhou e-commerce platform. Taizhou International e-commerce platform by the Internet business to provide comprehensive technical support and global multi-channel online marketing, Internet business is the industry's leading search engine marketing and overseas market network marketing service providers, with the leading search engine marketing (SEO & SEM) techniques and the International Business operations management experience, thousands of overseas export enterprises to provide professional online marketing solutions and services each year for services enterprises to create more than one billion dollars in international orders. Taizhou International e-commerce platform the most comprehensive application of the Internet's leading business search engine marketing technology, our goal is to Taizhou Taizhou international e-commerce platform into a region of the most influential international e-commerce platform for exporters to become exporters to the international Taizhou The most important market, marketing and promotion channels. International e-commerce platform has been Taizhou Taizhou Taizhou City Foreign Trade Bureau and the full support of the first team to move in 1000 export enterprises in Taizhou is hot in the application. Selected assigned to the export enterprises can get more government support for all marketing and promotion expenses. 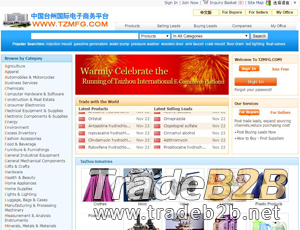 About Tzmfg.com - B2B Platform for china exporters's recommend,only on behalf of the views and opinions about B2B Directory, if you have any suggestions , please feel free to contact with us, we will amend and correct them in the first time according your suggestions. More better B2B Websites recomend, Please click here.